A garage can be a dark and dull place without the right kind of lighting. There are a number of garage lighting ideas available, though florescent light strips would be the only suggested route to go down. Additional lights can work alongside these florescent strips such as work and decorative light fixtures. There are also ways to make a garage less sterile looking while still using these florescent strip lights. We go over all of this below, along with a lot of photos so you can get a good idea of how the lights will work in your garage. In the examples below, the best looking garages are the ones that use a number of different garage lighting fixtures and techniques. If you want the best garage lighting design, then use florescent light strips. There are a number of benefits to using them. They easily light up a large space, are energy efficient, with the right ballast will work in cold weathers, and if you have a work shop and use paints – florescent lights show true colors. There are a variety of florescent light strips – you have the T4, T5, T8 and the T12. The numbers represent the different widths in diameter. They produce different amounts of light, so choosing between them is based on how much space is in your garage. If you have a garage that gets cold, below 50 degrees F, you’ll want to avoid T12s and instead use the T8s – and use an electronic ballast rather than an electromagnetic one. If you have a high ceiling or want to install these lights over a work space, then you can find light fittings that come with a chain so you can hang the lights lower down from the ceiling. LumaLinks is a company that provides garage lighting fixtures. Their lighting system allows you to tap into an existing light outlet in the ceiling. You can easily expand and tailor your garage lighting layout to your space without additional wiring. 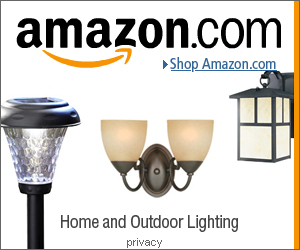 The florescent garage lights in the picture on the left can be bought on Amazon here. You can always add florescent light covers to diffuse the lighting, reducing the glare from the light strips. 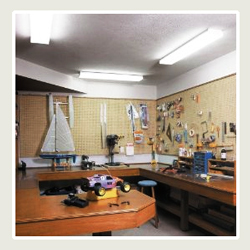 If you have any work areas in your garage, you will want to have specific lights focused on those areas. Ceiling lights will either not reach the work areas or will cast shadows making it difficult to work. One option mentioned earlier was to use florescent shop lights that are low hanging.